This house was rented by two families for a total of 10 people including 3 children and 3 teenagers. We all found something to our liking. 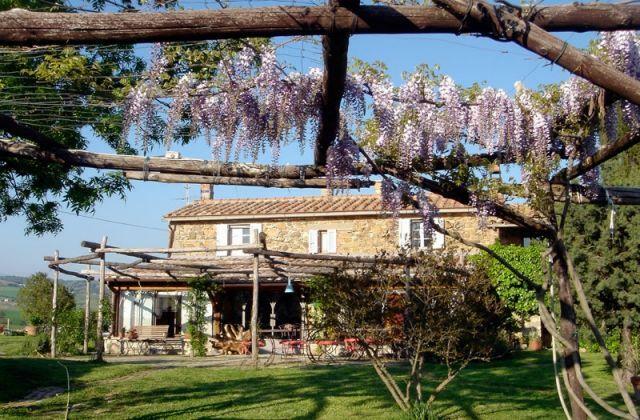 It is located in the vicinity of Saturnia so close to the hot springs and many medieval tuscan towns. Our welcome was warm, we were showed around the property and our host gave us ample advice on things to do and places to visit during our stay. The owners live in a small house on the premises. There is ample space to accommodate a large group inside and outside of the house. Every room except one is equipped with an in-suite bathroom, which was handy given the size of our group. There are also several sitting areas all around the house. The younger children are independent enough that we could let them roam around the property playing and . The teenagers and the adults could lounge around on the terraces or around the pool. The pool was clean and maintained daily during our stay. This pool was big enough for all to use without feeling crammed. There were a few instances were appliances were problematic (gas stovetop that we couldn't turn on, dishwasher that was acting up), but our host was quick to respond and offer help. Being located at the top of a hill, the view of the Tuscan countryside is breathtaking. It is also quite secluded, neighbouring houses being quite a way away. The nearest market being about a 15 minute drive away. The nearest supermarket is about a 25 minute drive. Being a country house, there were many insects, but nothing that a good insect repellent couldn't handle. To summarise, we all had a lovely time and highly recommend it. How easy was it to book the property? How helpful were the directions to the property? Was the property as advertised? Would you recommend the location of this property? Did the property offer wi-fi/internet access? Looking for a place to stay in Saturnia?